We have an Ordinary BoL (one circlecurrent only) in horizontal motion from west to east, not far above the ground. 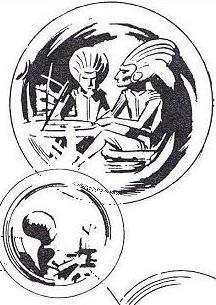 The BoL is viewed from above and one moves along with the BoL. One sees the soil moving from east to west behind the standing still BoL as if you stand on a driving car and look to the ground. Consider again the horizontal component of the magnetic field of the BoL (fig. 6.1, first circle), the plane of analysis just below the circlecurrent (see small drawing below). 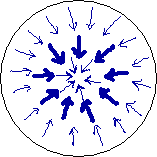 The circle next to the magnetic field gives the exerted forces on the ions in the crop stalks. 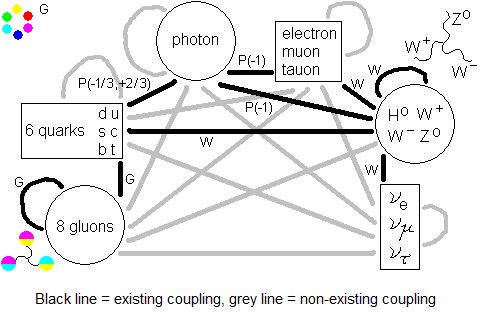 In D the force points to the ground (Lorentz force law) and in U it points to the sky. At the line of crossed zero’s in the middle no force is working since the velocity of the BoL is along the magnetic field lines there. In the space between the force in U as well as in D diminishes when nearer to the line of zero’s. The horizontal component of the magnetic field offers no prospects for a push of ions to one side of the stalk. (Pushing ions up or down leads nowhere.) Let us look at the vertical component of the magnetic field in the same plane of analysis, see fig. 6.2. 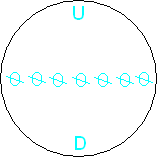 The magnetic field (first circle) points to the ground at the D’s. At the U’s the magnetic field points to the sky. At the crossed zero’s, right under the circlecurrent, there is no vertical component of the magnetic field. 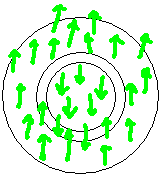 Mind, the velocity of the BoL is from W to E, so the ions in the crop move in the magnetic field of the BoL from E to W, see small picture below the circles. 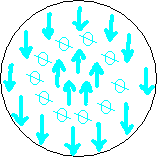 Therefore, light blue in the next circle, there is a ring with force from N to S, a central part with force from S to N and at the circle of crossed zero´s no force is present. 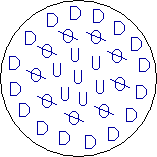 If this is directly translated to crop downing, one gets the green circle: a S-to-N downed ring, a standing ring just inside of it and a N-to-S downed middle circle. The ring of standing crop lays right under the circlecurrent, which is the diameter of the BoL. The borders might have sharp edges because below the threshold density of grow-ions no grow occurs - a convenient statement that yet have to be proven. Except for the northern outer border of the flattened ring: the bundles of crop smash there over the borderline inside the standing crop outside, making the border a little untidy. And except for the south border where the middle circle meets the ring. There the crop smashes from two sides into the standing ring. 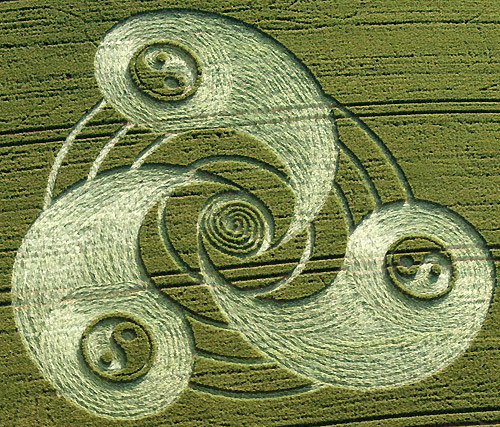 This untidyness is virtually never observed in cropcircles. The last crop downed - or the first? - just next to the border of standing crop, is always laid neatly along the borderline, in this way giving the cropcircle its perfect shape. 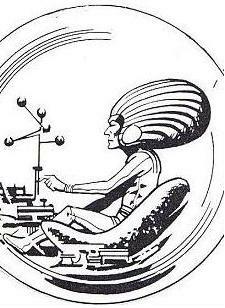 But all this will happen only if the BoL moves above threshold-velocity just a tiny distance. When the BoL moves a larger distance in a straight line from W to E things are different. In the middle west-east-strip of the BoL’s path of influence, when the BoL passes by, the ions in the stalk experience first N-to-S force, then S-to-N force from the inside of the circlecurrent and then N-to-S force again. Let us suppose the impact of the inside of the circlecurrent is negligible compared to the impact of the rest of the strip. The force is strong there, under the inside of the circlecurrent, but the time that force is applied is short. The final result should be one E-W oriented strip of S-to-N downed crop. Therefore the southern border is neat with crop laid straight away from it while the northern border is untidy with crop smashing into the standing crop behind it. The horizontal moving Ordinary BoL can make the outline of cropcircles with its neat side and then lane next to lane flatten areas of crop. The Ordinary BoL can do it, but one has to coordinate its movement severely. Does the Harlequin at Winterbourne Basselt in 1997 consist of such lanes? Should a simulation program give better results? Horizontal movement might be too complicated to estimate in the way I do here. The SuperBoL has hardly any vertical field working. So the SuperBoL most probably renders no effect in horizontal motion, just like the horizontal component of the magnetic field of the Ordinary BoL. 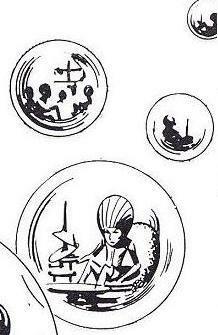 ...lived an antimatter life form.